Holy basil is a plant originally from India and has been used in Ayurvedic medicine to counter life’s stresses. It considered to be sacred by the Hindus and is often planted around shrines. Holy basil has long been a part of medicine and has been used for the common cold, influenza, H1N1 flu, diabetes, asthma, bronchitis, earache, headache, upset stomach, heart disease, and many, many more illnesses. It is mostly used, however, for its stress relieving properties. Holy basil has been said to have many medicinal properties including healing wounds, fighting bacteria, preventing diabetes, cutting cholesterol, protecting the stomach, protecting joints and boosting your brain. Its most widely popular quality is its ability to relieve stress. 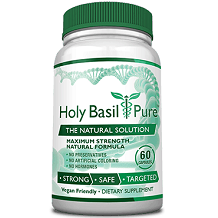 There have been multiple clinical studies proving the benefits of holy basil. There are many stress relief supplements on the market today. It’s important that you pick one with the correct ingredients and dosages to address your needs. The manufacturer recommends taking one capsule two times per day. At the time of writing this review this product was found at a price of $24.95 for a bottle of 60 capsules, which under the suggested use should last about one month. When researching this product, the manufacturer does provide a 30 day guarantee for this product but they charge a 10% restocking fee. 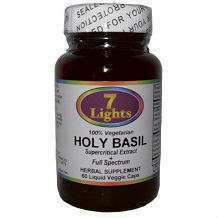 There are a lot of great stress relief treatment products on the market, including 7 Lights Nutrition Holy Basil. With that being said, when looking at the price of this product, its ingredients and the weak guarantee, a consumer may want to search for an alternative that best suits their needs in all rounded, effective manner.